May's Pond home and adjoining fence after fire. Photo credit: Fire District 7 Battalion Chief BC Hyatt. 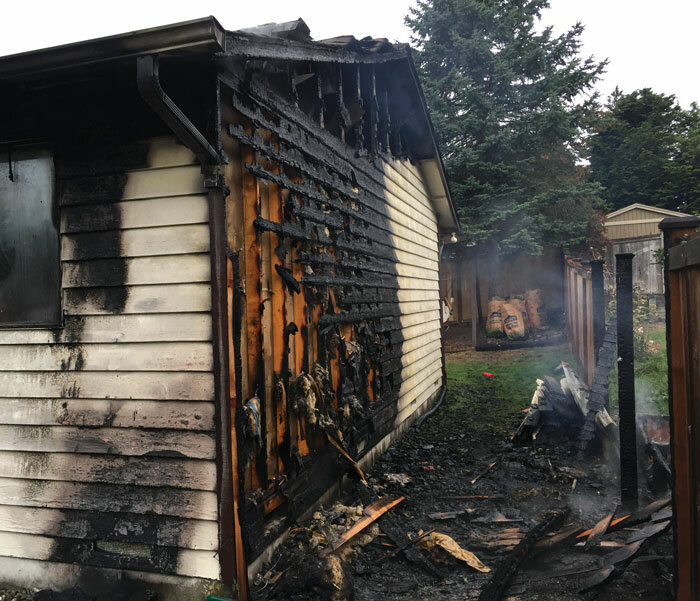 On Thursday afternoon, October 12, 2017, at approximately 2:38 pm, Fire District 7 was dispatched to a residential fire at the 2200 block of 179th Street SE in May’s Pond south of the City of Mill Creek. When firefighters arrived on scene they found an active exterior fire that extended into the attic of the home. Crews quickly pulled two hose lines and started fire control. Additional firefighters were on the roof conducting vertical ventilation. Crews were able to quickly gain control of the flames and extinguish the fire. No occupants were in the home when Fire District 7 arrived on scene. No injuries were reported. Snohomish County Fire Marshal was on scene to determine the cause of the fire, but has not yet communicated the results of the investigation. Fire District 7 firefighters after extinguishing house fire. Photo credit: Fire District 7 Battalion Chief BC Hyatt.